This fast-flying Lycaenid, the Scarce Silverstreak, can be found quite often in urban parks and gardens, usually in the vicinity of its caterpillar host plant, Ficus microcarpa. The male is shining deep greenish-blue with broad black forewing borders, whilst the female is drab brown. 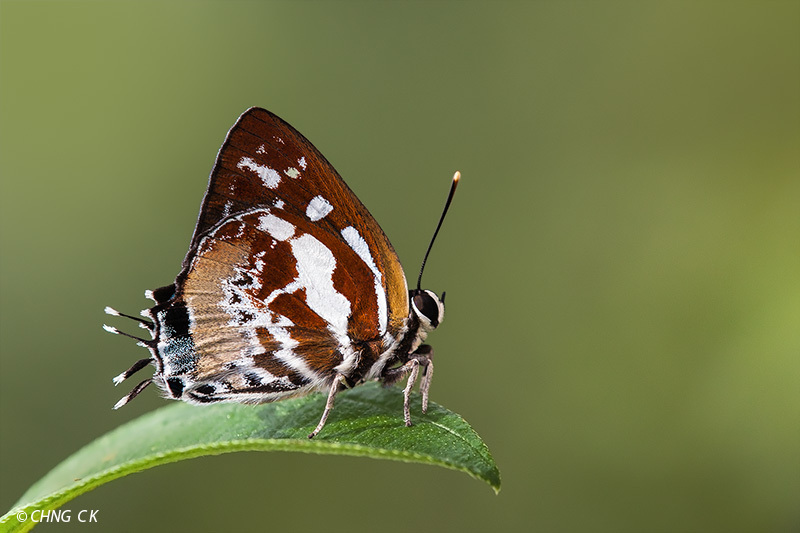 The underside is distinctively marked with brown and white streaks, and is unlikely to be mistaken for any other butterfly species in Singapore. This shot of a pristine male of the Scarce Silverstreak was taken by ButterflyCircle member Chng CK last Sunday at a herb garden. Here it is featured perched on a leaf of Melastoma sp. The complete life history has been recorded and can be found on ButterflyCircle's blog here.